Combined, their lives spanned 176 years. One operated Birmingham’s most notorious brothels (but there’s more to her story than that). Another helped pave the way for modern-day rhythm and blues. And the third spent most of her life under the bright lights of California’s Pioneertown with Gene Autry — but her last dying wish was to return hometo Birmingham where her heart beckoned. Barrier-breaking, soul-baring and risk-taking, these Alabama-born women embodied more than the typical Southern belles of their time. In an era when women were expected to behave like “ladies” and be seen and not heard, these women broke the mold in a big way. There might not be many books published singing their praises, but do a little digging and you’ll be led down a trail of inspiring triumph — at least, that’s what we discovered. Although these three vivacious Birmingham women are no longer with us, we believe their stories are timeless and worth telling. They prove that being bold — in mind and spirit — will always be the best look a woman can possess. Louise “Lou” Wooster was born in Tuscaloosa in 1842, one of six girls. An orphan by her mid-teens, Lou was dealt a tough hand early on in life. Left to fend for herself and take care of her sisters, Lou “fell step by step until, at last, she was beyond redemption.” By the time she was a young woman, Lou was a well-paid “lady of the evening.” While others turned up their noses at Lou’s occupation, it is written that she had a lively personality — and had a bleeding heart that would soon save hundreds from death and despair. When the cholera epidemic swept through Birmingham in 1873, Lou stayed back to nurse the sick and feed the hungry — ensuring there would be a Birmingham to come back to when the thousands who fled the city returned. After the outbreak, Lou moved to Montgomery where she opened a brothel (and, allegedly, had a brief romance with John Wilkes Booth). Later returning to Birmingham and opening several brothels near city hall, which attracted some of the city’s wealthiest clientele, Lou accumulated a small fortune. She didn’t hoard her wealth, however. Instead, she shared her bounty with local charities and often came to the aid of fallen women. A feminist before her time, Lou’s legacy is best painted with a heroine’s brush instead of a harlot’s. When she died in 1913, it’s said that hundreds of black carriages drove by her burial to pay respects to a local hero. The fallen woman is not more fickle than the virtuous woman. The wrong step having been taken, the tides of the ocean of the universe are against her. She would come to the shore, were it not that the tide is too strong, and she is always too far at sea for the tide, of itself, to bring her in … From faith, I gather this: The Son of Man is come to save that which was lost. Lou’s good deeds are still celebrated today through the Lou Wooster Public Health Award, given by UAB’s School of Public Health to deserving individuals, groups or organizations who are unconventional public health heroes. After receiving the award, recipients ride a horse-drawn carriage from the school to Birmingham’s Oak Hill Cemetery where Lou is buried. Her gravesite, overlooking the city she long ago called home, frequently attracts those who come across her story — which, in a sense, helped save Birmingham’s story, too. Before Elvis shook his hips and topped charts with “Hound Dog,” a lesser-known blues singer from Alabama crooned the famous tune, paving the way for its eventual success. 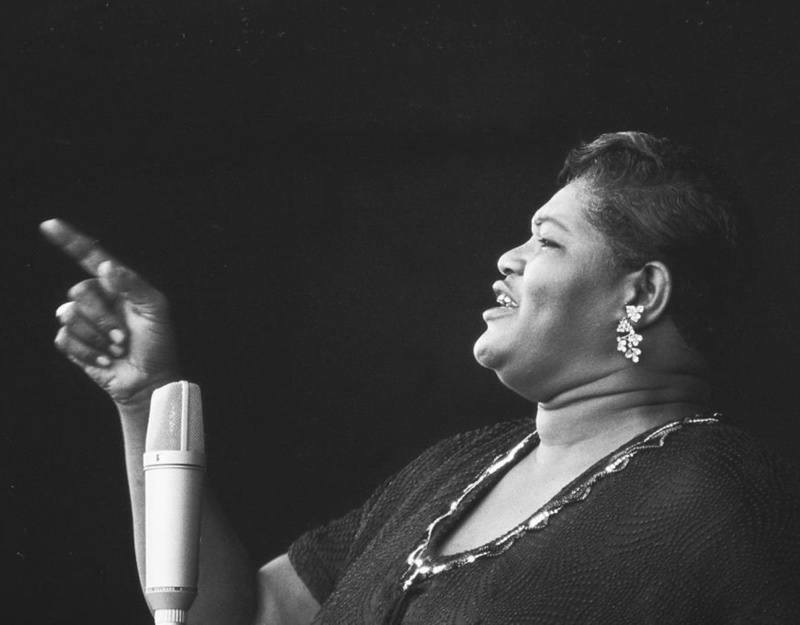 Montgomery-born Willie Mae “Big Mama” Thornton is often credited with helping establish the rhythm and blues genre. Like most musicians of her time, Willie Mae — who stood six feet tall and at most weighed more than 300 pounds — got her musical start in the church choir. When hard times fell on Willie’s family, which included seven children, Willie took a job cleaning at the town saloon. One evening, when the local talent didn’t show, Willie was asked to take the stage — debuting her earthy voice to a different kind of congregation. Soon enough, Willie captured the attention of Sammy Green’s Hot Harlem Revue. The budding musician and singer joined the vaudeville troupe, singing and dancing her way through the South. Mastering the harmonica, drums and guitar with no formal training, Willie seemed to be born with a natural tune in her soul. In 1951, lyricist Jerry Leiber and composer Mike Stoller asked Willie to sing a bluesy tune called “Hound Dog,” which only a few years later was forever immortalized by the King of Rock ‘n’ Roll. Willie’s version, which is much slower and has an almost menacing tone to it, is an undeniable sensation in its own right. Although Willie only ever received a $500 check for her recording, she undoubtedly paved the way for the prolific song. She was one of many African American singers whose songs were later covered by more nationally known white singers — never fully receiving the credit (or the money) they deserved. Nonetheless, Willie went on to become a revered name in countless circles. Influencing several generations of musicians, Willie was known for her larger-than-life personality that captivated countless crowds. Toward the end her life, whiskey got the best of her, and her health began to fail. Plunging below 100 pounds at one point, Willie — determined to still take the stage — masked her frailty by wearing oversized men’s suits and a Stetson hat. Never married and with no kids, Willie’s life is one that trail-blazed through adversity and left its mark on many artists. One of the first openly gay musicians, Willie also opened the door for subsequent artists to test the limits of gender and sing more openly about their sexuality. Taking her last breath on July 25, 1984, Willie’s life and voice will not soon be forgotten. Born in Birmingham but raised — and educated — around the world (her parents aided in some of the first South American expeditions by plane), Madelyn Beatty rested little throughout her storied life. From a young age, Madelyn was exposed to the great wonders of the world — namely, exotic jungle animals, which her father would send back to her to keep as pets. One such pet was mistakenly noted as a Bengal tiger in the local newspaper. Because it would have been cumbersome to keep a tiger in her Mountain Brook home, Madelyn’s family gave the creature to the Avondale Zoo. The bulk of her days were spent in the western cowboy movie industry out in California’s Pioneertown — an 1880s-themed, living-and-breathing movie set founded by a group of Hollywood investors, including actors Roy Rogers and Gene Autry, but instead of false façades, the town actually had fun things for visitors to see and do. Madelyn resided in Pioneertown for more than 40 years where she was known as an expert animal trainer. Later on in life, Madelyn “rode rodeo,” where she became well-versed in rope tricks, bronco busting, calf roping, hog tying, bull riding and barrel racing. She trained her trick horse, “Whippasaw,” to do more than 100 tricks and was invited to perform at the World Championship Rodeo at Madison Square Garden in New York. Few photos ever show Madelyn wearing anything dressy, as she usually donned a cowboy getup. “She was definitely ahead of her time,” her sister, Mary Alice Carmichael, says. In 2006, at the age of 80, Madelyn watched much of her beloved California home get torched to the ground in an unforgiving wildfire, which she narrowly escaped. A decade later, she returned for a short visit where she was warmly greeted by those who knew her best. “As a master storyteller with an unending store of the tales and lore of that heyday period, she thoroughly enjoyed being interviewed, photographed, taped and videoed as she kept the audience spellbound during that visit,” Mary Alice wrote in Madelyn’s impressive obituary. Ultimately, Madelyn’s last race was one against time. Terminally ill and in hospice care in California, Madelyn — at the age of 91 — requested to be brought back to Birmingham, if not to just spend a few of her last days in the city she once called home. “She was very anxious to see the big iron man, Vulcan,” Mary Alice says with a smile. Because of her frail health condition, the only way Madelyn could safely make it home was by car. Luckily, her family was able to band together to get her there — flying to California and then renting an RV, driving hundreds of miles’ worth of road back to Birmingham. Katheryn Carmichael, Madelyn’s great-niece, served as the resident nurse on the trip. The long, bumpy drive was something Katheryn says she will never forget. Upon crossing the Mississippi state line, she recalls Madelyn asking the group to pull over. “She wanted to see the river, one last time,” Katheryn says, adding that Madelyn told several stories throughout the trek — stories of wild animals, taming horses and adventures across the Golden State.